It’s our holiday weekend in Canada, the long weekend in May that’s the unofficial kickoff to summer. And the weather is … not so great. Although yesterday was cool and sunny, it’s downright cold today, and it’s been raining off and on all day. It’s less of a “burgers in the backyard” kind of day than a “nourishing bowl at the kitchen table” moment. Well, I’m happy to oblige. This vegetable fried rice kept me toasty warm as I watched the rain pelting on the barbecue cover, from inside the house. The recipe isn’t difficult, although you’ll want to have all the ingredients chopped and ready to go before you get started, because the recipe moves quickly once you begin. I also wrote about the cold, wet weather in my last post; it seems to be the theme of the month. Looking at the weather forecast, I see they’re calling for sun tomorrow, followed by another week of rain. So I’d better get that “burgers in the backyard” day in fast! Note: I halved the original recipe, and got 2+ servings. If you’re cooking for a bigger group, check out the original recipe which would serve 4-5 people. This recipe comes together quickly, so make sure you’ve chopped all the vegetables and set all the ingredients in a convenient spot. Warm a large skillet over medium high heat, then add 3/4 tsp safflower owl and swirl to coat the bottom. Add the egg and cook until lightly set, stirring along the way. Transfer the eggs to a bowl and wipe out the pan with a spatula. Return pan to heat and add 1 1/2 tsp oil. Add onion and carrots and cook, stirring often, about 3 – 5 minutes. Add remaining vegetables and salt. Continue cooking, stirring occasionally (not too often or the edges won’t turn golden), about 3 – 5 more minutes. In the meantime, use the spatula to break up the scrambled eggs into smaller pieces. Transfer the vegetable mixture to the pan with the cooked eggs. Return the pan to the heat, and add the remaining 1 1/2 tsp oil. Add ginger, garlic and red pepper flakes, and stir constantly for about 30 seconds. Add the rice and mix it all together. Cook, stirring occasionally, until the rice is hot and starting to turn golden on the edges, about 3 – 5 minutes. Add greens and green onions, and stir to combine. (Greens should be just starting to wilt.) Add cooked vegetables and eggs, and stir again to combine. Remove from heat and stir in soy sauce and sesame oil. Taste, and add extra salt if necessary. Divide into bowls and serve immediately. Leftovers store well in the fridge for 3 to 4 days. We have been getting alot of rain too, though yesterday the sun came out and I worked in the garden most of the day. 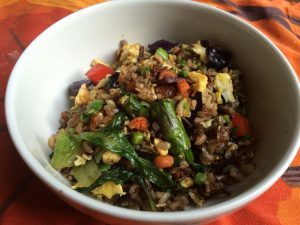 I love fried rice, this is a wonderful recipe, thanks beth. It's been raining here too. My daughter loves fried rice. I may have to try this. It finally got sunny here in Northern California after a winter with lots of rain that we desperately needed since we had a drought for the last six years. It was cold and rainy when I visited Germany and everybody was waiting for a sunny day. Your fried rice looks delicious and healthy. We have had rain, rain and more rain. Thank goodness the sun came out just in time for Bill to fire up the grill for dinner. 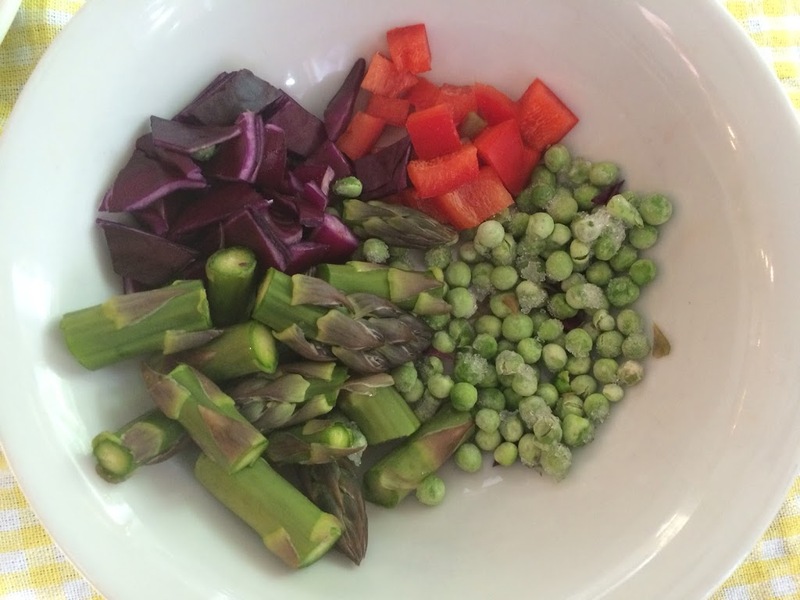 Your healthy veggie bowl looks scrumptious (just the sort of thing I'd love for lunch!). The weather wasn't great over here last weeks, but it's getting better and warmer! The veggie fried rice looks very appetizing! It's a very rainy day here today and likely the whole week but we did have a beautiful weekend. 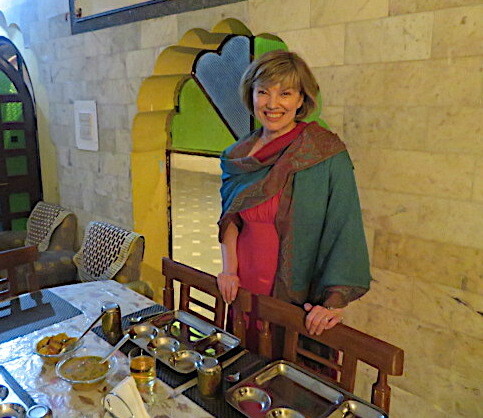 Lovely to have warm comfort food to enjoy during bad weather and otherwise. I love a good fried rice and the veggies are super appealing. Our weather has been totally all over the place. Snow, rain, you name it. Thank goodness our neighborhood hasn't had hail!I'm with you on grilling, but this looks fantastic! It's been very rainy a lot here, too, lately. It's kind of crazy the weather we've been having. 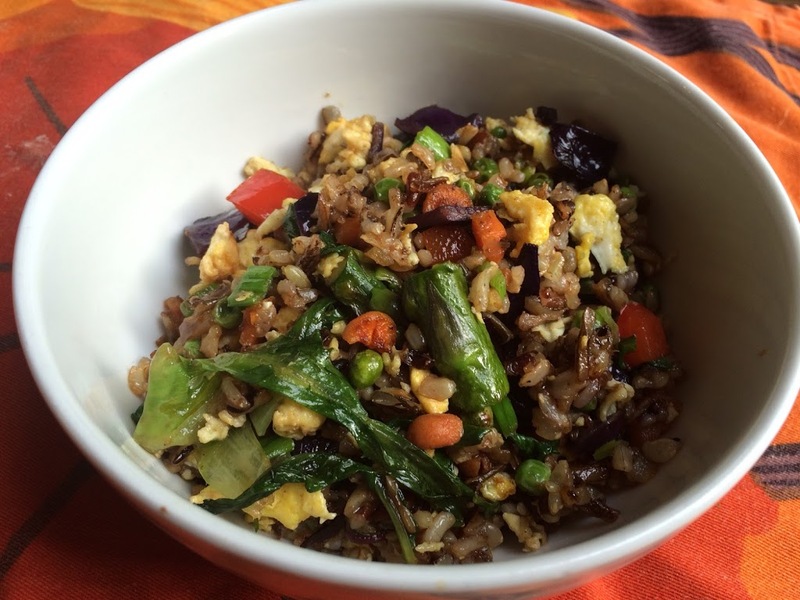 We love making fried rice – looks yummy! We have our long weekend next weekend! And I'm thankful not to be hosting. I love thgis vegetable fried rice Beth !! Lot of rain here, too, although warmer weather. But this would certainly be welcome! Good stuff — thanks. The weather is very versatile here too! One day sunshine next day rain! This bowl is making me smile! Hope you had a wonderful holiday weekend, Beth The weather is pretty same here as well. This looks so pretty and sound so delish. One of my favourite things to make! So simple and just the thing when you need an easy, quick dinner. I'm sending you a big box of sunshine and heat. Do you want some humidity as well? It is so hot here just now, I would love a trade. I've never thought to put cabbage in a stir fry…it adds color, texture and extra flavor. We have another long weekend now, so tomorrow is free. But rainy and cold as well, so no chance of picnics or coffee in the garden… Your fried rice looks delicious, perfect for this weather. Our May Long weekend was horrid weather as well. Hubby was fishing and very, very cold & wet! Love a good stir fry! Sorry to hear the day was rained out, but I love fried rice! It's one of my favorite things, and all the vegetables in this one look great. I hope the sun finally came out where you are! It's overcast for us today, but otherwise it's been blazing hot here 🙂 I would love a big bowl of your veggie fried rice right now. Really looks like a wonderful meal!